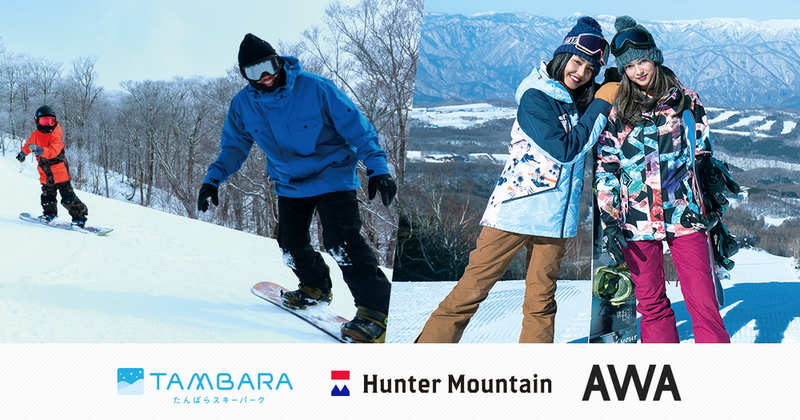 AWA also plans to give away a pair of lift day passes valid for the 2017-2018 season at Hunter Mountain Shiobara and Tambara Ski Park through AWA's official Twitter account to a lucky 25 couples (50 individuals) (*2). (*1) "500 JPY off an adult lift ticket"
-This discount is good for adult tickets only. Cannot be used together with any other ticket type discounts (senior, child, etc.). -Cannot be used during special discount periods (spring ski rates). -Cannot be used with any other discount tickets, complimentary tickets, or corporate products. -Valid for one customer per showing. -Please show the AWA app screen at the lift ticket sales gate. -This campaign is valid until March 31, 2018. -Enter for a chance to win a pair of adult lift day passes valid for the 2017-2018 season. -Resale is prohibited. -Multiple entries are allowed, but you may only win once.